Since using bliss on my music collection I've enjoyed downloading album cover art for recordings I didn't expect to. A good example is a CD given to me at an Afghan wedding I attended. The CD was by a performer at the event, a classical tabla player. The CD came in a case with cover art, but being too lazy to scan the cover I never thought I'd see the art displayed on my Squeezebox. I was wrong! bliss found the art art on a blog using its Google search capability and installed it for me. Another common example in my music collection are cover mounted CDs. In t he UK a music magazine called 'Q' often offer compilations of tracks along a given theme, mounted on the front cover of the magazine. 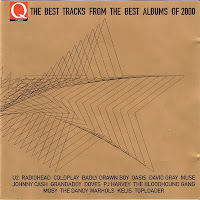 Previous examples were Essential Chill Out and The Best Tracks From The Best Albums Of 2000. Thankfully, art for these records is stored on the online database at discogs.org, which bliss searches, so this art was found automatically too! It's been great to get a complete set of album art for all the odds-and-ends in my music collection. If you have trouble finding album art for rare recordings, give bliss a try!